“Never Again” marked the conclusion of Consul General Dr. Konstantinos Koutras’ impassioned speech against intolerance and apathy at the “Holocaust Remembrance Day of the Greek Jewry” on January 23, the third commemoration of the International Day of Holocaust Remembrance, Consul General Koutras has organized and hosted at the Hebrew Union College-Jewish Institute of Religion in Manhattan since his tenure in New York began. “We wish this event will, once more, unequivocally reaffirm our common commitment to stand against racism, anti-Semitism, and the instigation of ethnic or religious violence as a criminal act,” was this year’s theme. 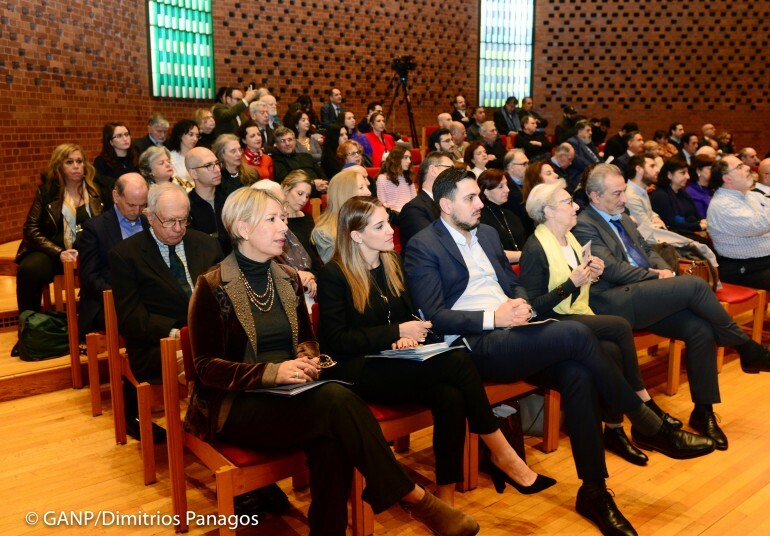 The annual commemorations of Greek Jewry for the International Day of Holocaust Remembrance hosted by the Consulate General of Greece in New York at Hebrew Union College, profound by their very nature, have been deeply bonding events. This time, excerpts from a film, from a letter, and two songs emphasized this emotional historical connection. Mr. Robert Shaw, who has held many important positions in the Geek American community of New York, one being director and vice chairman of the Hellenic American Cultural Foundation currently, was Master of Ceremonies. The event brought together His Eminence Archbishop Demetrios of America, Metropolitan Evangelos of New Jersey, Rabbi Dr. Martin Cohen of Hebrew Union College-Jewish Institute of Religion, Consul General of Israel in New York, Mr. Dani Dayan, Permanent Representative of Greece to the United Nations, Ambassador Maria Theophilis, Mr. Solomon Asher of the American Friends of the Jewish Museum of Greece, Mr. David Harris of the AJC – Global Jewish Advocacy, US and Greek diplomats, and distinguished board members of The Sephardic Jewish Brotherhood of America and American Sephardi Federation. Consul General of Israel, Mr. Dani Dayan followed, and congratulated Consul General Koutras for organizing this event every year since he arrived in New York. “When we speak of the Holocaust in Greece, two events—very different events—come to my memory immediately. The first one is the Jewish community of Thessaloniki, or as we Jews called it, Salonika, the Ladino, the Jewish-Spanish language, wasn’t spoken by the Jews of Salonika, which was referred to as ‘the Mother of Israel’,” and where the “strong community of forty thousand Jews was decimated”. “The second thing that comes to his mind is the island of Zakynthos in which not one Jew was killed”, because of Bishop Chrysostomos of Zakynthos and the mayor, Loukas Karrer. Excerpts from the documentary film, “Life Will Smile”, introduced by the Greek American Producer Steven Provolos featured a Greek Jewish survivor on the island of Zakynthos. Eight years old when the Germans invaded Greece, he talked about his idyllic life on the island, where he felt no social differentiation between Christian and Jew, just harmony, and his friendship with a Christian girl, riding their bikes to picnic on the beach. He recalled the situation of the Nazi Kommandant calling in Bishop Chrysostomos and Mayor Loukas Karrer of Zakynthos and ordering them to provide a list of the Jewish occupants of the island and their holdings. They returned the next day with a list which named themselves as the only Jews on the island—thus saving the entire community from annihilation. He is overcome with the gratitude to the Bishop for this act. At the end of the film, in a stroke of high art, he is shown walking a road above the sea singing the moving, lyrical Greek song, “I Love You Because You Are Beautiful”. Keynote Speaker, Katherine E. Fleming, Provost of New York University and Alexander Onassis Professor of Hellenic Culture and Civilization, who spoke about the strong Greek identity of Greek Jewish individuals, read excerpts of a heartbreaking letter written by a member of the Greek Jewish community of Thessaloniki who was forced to be a Sonderkommando at Auschwitz- Berkenau. In the letter, found on the grounds of the concentration camp, stuffed into a thermos–hopefully to be found and delivered—the prisoner allots his possessions and repeatedly states his pride in being Greek, the honor of dying as a “proud Greek”. 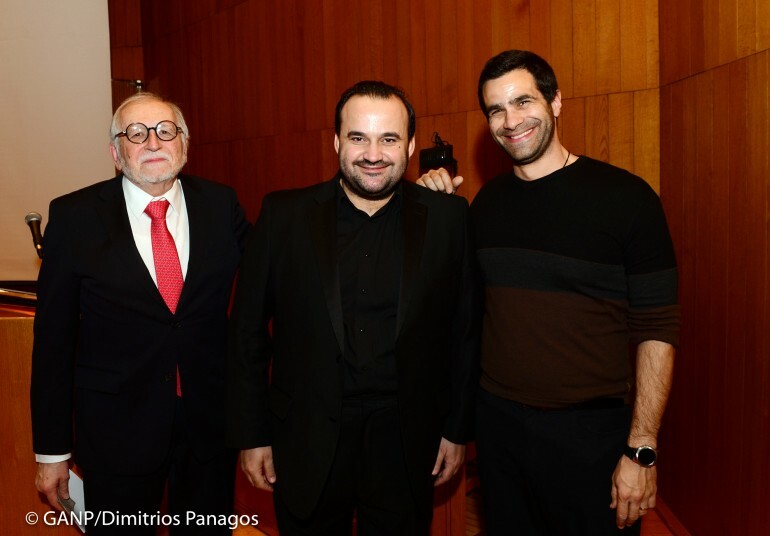 Chanter Nektarios S. Antoniou, accompanied on piano by Mr. Phyto Stratis, sang two wrenchingly sad songs from Mikis Theodorakis’ The Ballad of Mauthausen: In Memoriam of Liberation (a cycle based on poems written by Greek poet and playwright Iakovos Kambanellis, a Mauthausen concentration camp survivor). 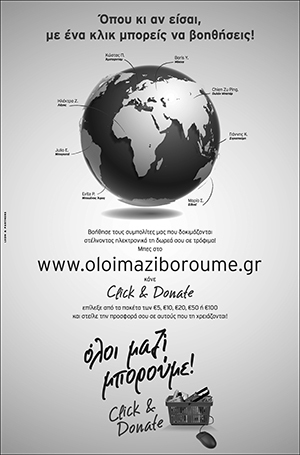 Mr. Solomon Asser, President of the American friends of the Jewish Museum in Greece spoke about the museum. He also spoke of his mother, Rosa (seen in the documentary “Kisses from the Children” about five Jewish children in Thessaloniki who were successfully hidden from the Nazis), and pointed out her close friend, who was sitting in the audience. He also asked survivors of the Holocaust to stand, noting their diminishing numbers. 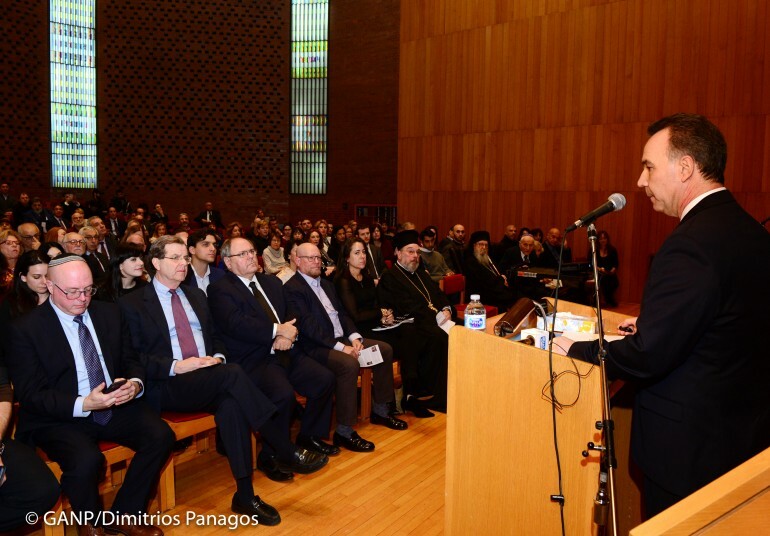 Rabbi Dr. Martin Cohen of Hebrew Union College, speaking highly of Archbishop Demetrios and of their friendship, talked about the ties of friendship, brotherhood, and truth between Jews and Christians, values that inform both Judaism and Christianity. 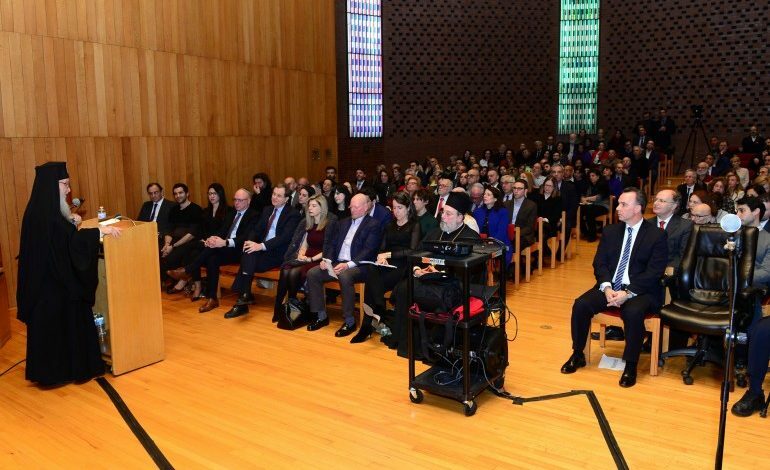 The act of remembering the Holocaust and other atrocities suffered by humanity, serves to emphasize the importance of saying “Never again”, to choices that would cause such tragedies to be repeated, he said. As a cantor wasn’t present he said three prayers, one a Kaddish, a Prayer for the Living Dead. 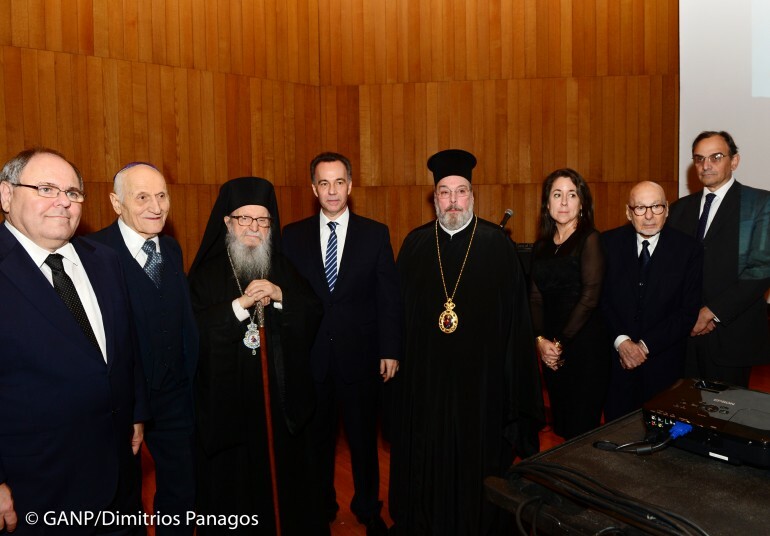 His Eminence Archbishop Demetrios closed with remembrances of the first 18 years of his life lived among Jews in Thessaloniki with penetrating insight of Jewish wisdom and the necessity to teach tolerance, understanding, and appreciation of differences.